Maximum size: about 60 mm. 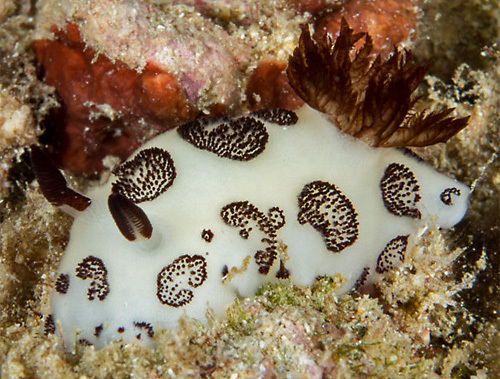 Identification: This is a distinctive, cream dorid in which the notum is decorated with patches of slightly elevated, black papillae. The rhinophores and gills are black. Distribution: Big Island and Oahu: widely distributed in the Indo-Pacific. Taxonomic notes: It was first recorded in Hawaii from the mouth of Pearl Harbor by Spencer Verhoef on April 10, 2014. Photo: David Rolla: Point Panic, Oahu; Jan. 7, 2017. Note 1: Although first found in early 2014, it has since become fairly common at Pearl Harbor and Point Panic (Erik Verhoef & David Rolla, pers. com.). Whether it's a recent introduction or is just having a "good year" is unknown. David Rolla found a young animal at Haleiwa in fall, 2018 and Jeremy Bricco recently photographed one at Kawaihae on the Big Island. So, if they are introduced, they appear to be spreading. Note 2: One of David Rolla's Oahu photos shows an animal next to a slate-blue sponge. (see photo) Although there is no obvious feeding damage in the photo, the sponge is similar to sponges illustrated as the food of this species on the Sea Slug Forum (and elsewhere).